Disclosure: Scout and Zoe’s and Budget Earth partnered together for this article to educate our readers about antlers (a subject Reya loves!) While Reya received an antler as part of this, all opinions are 100% my own. In our household we are big fans of natural treats. We go out of our way to find only the best treats for Reya. Not only do they have to be all natural and void of all scary chemicals, they also have to be made in the United States. While this may not sound like a big deal, it is easier said than done, especially if you want treats that are a great value for the money and are loved by your dog. While we were looking for high quality antlers and treats for Reya, we were introduced to a new company that not only fit our philosophies but made amazing treats for our big girl – Scout and Zoe’s. When we heard they would like Reya to try their yummy treats, we couldn’t wait for her goody bag to arrive! Scout & Zoe’s Natural Treats: What is It? Looking for all natural treats that are perfect for every dog? If so, we think you will love all natural treats from Scout & Zoe’s. Their treats are designed to not only be natural, but allergy free as well! Their treats are chosen to be easy on doggy tummies, and made from only the best natural ingredients without any harsh chemicals or questionable preservatives. All of their chicken is made in Indiana and made using USDA grade A boneless, skinless chicken breasts. In other words, they are perfect for our four-legged best friends! Along with their yummy chicken, they also carry USA grown dehydrated Sweet Potatoes Dog Treats, and Carrot Dog Treats. With their great line of antlers (learn more here about antlers), you know you are getting the healthiest, made in USA treats around for you pup when you shop at Scout & Zoe’s. 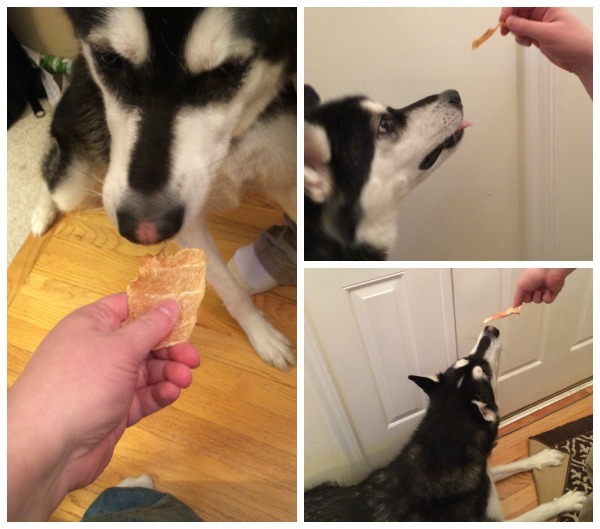 We are pretty certain once your pup has tried their treats, they will be just as addicted as us! So far, there treats are a big hit in our household. From the moment I opened the bags Reya was doing hops! These treats seem to have the perfect crunchy texture for Reya, allowing her to deal with her chewing urges while getting a nice tasty treat. From how Reya reacts every time we get out the treats I think they may very well be her new favorites when it comes to training or snack time. It’s really hard for me to pick a favorite since she seems to equally love the chicken jerky, sweet potato treats, and carrots treats. If I had to pick her favorite, though, it is likely the chicken. She is a big fan of this jerky and mom and dad love that it is made right here in the United States. I think Scout and Zoe’s now has a new eager customer with how much Reya loves these treat and their antlers. Based on our own experience, we are delighted to give Scout and Zoe’s an A+ rating and highly recommend their products to all of our readers. Want to purchase some of these awesome treats for your own four legged family member? 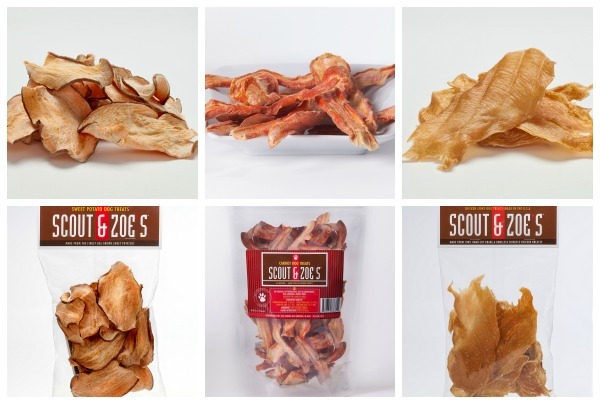 You can buy all the treats featured in this review on the Scout and Zoe’s online store or use their store locator(on their homepage) to buy them at a store near you! Want to learn more? Check out Scout and Zoe’s on Social Media! Disclosure: Budget Earth did not receive monetary compensation but did receive an antler as part of this informative article. All opinions on this product are my own and may differ from our readers’ opinions. i feed my girls natural treats, but no rawhide, i use cow’s ear or lamb’s ear, small bully sticks, and beef taffy, dried tripe strips. the 2 younger girls like dried sweet potato but the oldest gal does not, she wont eat the…cant use the chicken b/c my oldest cant eat chicken. I haven’t heard of this brand before. I’m always on the lookout for healthy treats for my dog, Mickey. He was starting to gain too much weight from too many table scraps. It was really hard, but he’s been cut off of that completely except when we visit my parents. My mom always cooks her dog and my dog something separate. Usually some plain chicken, which I don’t think will hurt. Anyway, I ramble…I’m going to pin this post so I remember to look into it next time we buy treats. Great treats. will be trying these. Thanks for the tip ! My dog always loved his treats and I love that they are natural and allergy free. I normally make my own dog treats every 2 weeks or so, but I wouldn’t mind a break from it! I will be looking into these. Thanks for posting! I used the store locator, and unfortunately, these Zoes treats are no where around here. I prefer to buy food items for my dog locally. These sound great, and Made in USA is something we all should look for. Wish them success, and hope it expands to our area. This procut looks great! I will have to see where it is available to me! What a great company to make all natural treats for our pups!!! Ive never heard of them before but will definitely look for them in the stores!! In the wake of all this “well known dog food company killing animals with their food” scare it’s nice to know there are good options still available! Awe your little pup looks super happy to be getting her treats! My dogs are obsessed with sweet potato so we would probably be getting those! I need to let my dogs give these treats a try! I’m sure my dogs will love them! She is a stinker, that’s for sure! Our cat will “kiss” me until I give him a treat. You will have to make bigger bags of treats because I will be stuck having to go to the store daily. Just kidding ~ keep up the great job. Yay a giveaway so I am back to comment again for that this time. Would love to get the sweet potato treats for him to try. I adopted a senior dog last month who at five years old had never walked on a leash, never learned a command – he has been seriously neglected. Mike is his name, he is very treat motivated though. I don’t think anyone has ever given him treats and he seems amazed and delighted each time. So far he loves going out on the leash (with a comfortable harness) but ‘sit’ has eluded him. I have been feeding him only natural healthy foods and that is helping him a lot. I think these treats might be a great part of his new life. I would like to give these to my sister for her dog. I know he would enjoy it. I am very picky about what treats I give my pets especially my dog, but after reading your review I think these would be a good choice. You had me at natural!!! I only feed my girl natural treats. No artificial junk for her. A very good review with awesome information. It is a seller!! I have several dogs, so it’s important that they be well behaved. I have been too scared to try a lot of the treats, to use with my training, as they are from China. These natural treats will help me a lot with my sit/stay. These are great treats for any dog and are very health. I’m always look for healthy stuff for my pup. These sound really good and I think that my dog would like the sweet potato treats. Although, he’s not picky and likes just about everything. I think it’s great that they have an on line store. I do a lot of my shopping on line. I love that these dog treats are not only natural but allergy free as well. There has been great progress in making better treats. These sound like healthy dog treats. I am sure my dog will love them. I was just recently reading about how good sweet potatoes and carrots are for dogs, so I am very happy to learn of Scout and Zoe’s treats. Looking at their online store, they have some wonderful products. My dogs would love them! I’ve heard conflicting reports on using treats for training. I think you should. I believe a reward system helps in learning. I carry treats in my car to make friends with other peoples dogs!! I think these treats would be good for my dog. I am hesitate to buy some treats in the store because I don’t think they are safe or will make my dog sick. I was unfamiliar with this brand until now. I am always hunting good quality treats for my 3 rescues. Thanks for the review! Your cutie looks very happy!! I am sure that my Basset Hound would love these Treats, I love that they make them in the USA and that they are all natural, I wish that She could eat Chicken, She loves it but She is allergic to it. But I will definitely look into getting Her the others! I would love to try these treats out for my pups! They are so spoiled! I give my dogs raw beef bones for chewing, they are more flexible and digestible than antlers, which cause broken teeth in many dogs. I like the other crunchy treats. Antlers are actually very good for dogs and almost no different from raw bones. That is actually a myth. Unlike raw bones, they don’t splinter. And cute photo of your furry baby. Except looks like all of the bags (closed) of treats in front of her is almost cruelty. ;o) Has to do tricks and training galore to get at them. great treat for dogs I love it. Your dog is lovely and I like the picture of her with the treats between her paws. I’ve never seen this brand in my local stores. They look like awesome products that would make healthy treats for my dog. I love the fact that these treats are both natural and made in the USA. I rarely see anyone reading labels for dog treats (I do it regularly.) My theory is that id I won’t eat it, why would I give it to my dog? I haven’t seen this brand in the store I normally shop in, but I look forward to picking them up in the future for my babies. I would of never thought to give a dog an antler but after reading about it I just might try it depending on the price, I love the fact that it naturally falls off the animal and that it has so many healthy minerals. It also interest me more because it’s made in the good old USA. It’s important to me that my dogs treats are healthy and made in the USA. Would love to let them try these. Great review, I love that these are natural and us made. Sounds like a great company! Can’t wait for my husky to try them! i love that they are made in usa. the chicken is usa. no gmo’s, all natural, dehydrated so it does not lose the nutritional value. 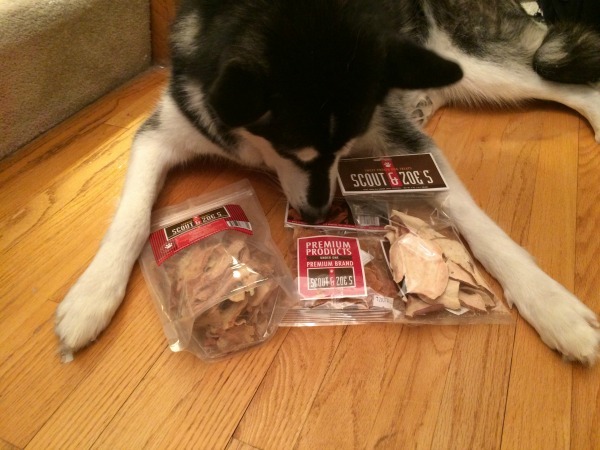 I had never heard of Scout & Zoe’s , or antler treats/chews until this site. I have a big girl @ home who I think could benefit from these. I’m like you that I like getting natural treats made in USA for my two babies”. Most times I get Nufges and Milo’s z Kitchen. I was disappointed that this brand is not sold in NC. I may just have to talk hubby into ordering some! I have five rescued Treeing Walker Coonhounds and I worry about what they eat. There are so many products on the market that have had bad reports. Too many containing ingredients that have been proven to NOT be healthy for dos. I’ve switched the food they eat to grain-free products without unnecessary additives etc. These treats sound great and would fit into my feeding plan for my dos. I love that these treats are natural, made in the USA and have limited ingredients. I have a dog with beef allergies and she has a sensitive tummy. I think these treats would be perfect for her! Thanks for sharing! I haven’t heard of this brand before or antler treats/chews until this site. love that they make them in the USA and that they are all natural, I’m sure my Blackie would love them. Thanks for sharing. I know my dogs will love the treats! He goes crazy for any type of treats so any of these treats would make his day! One of our dog’s has a stomach that has had issues since the day we brought him home. It took several changes of dog food and we have to be very careful what dog treats we give him. 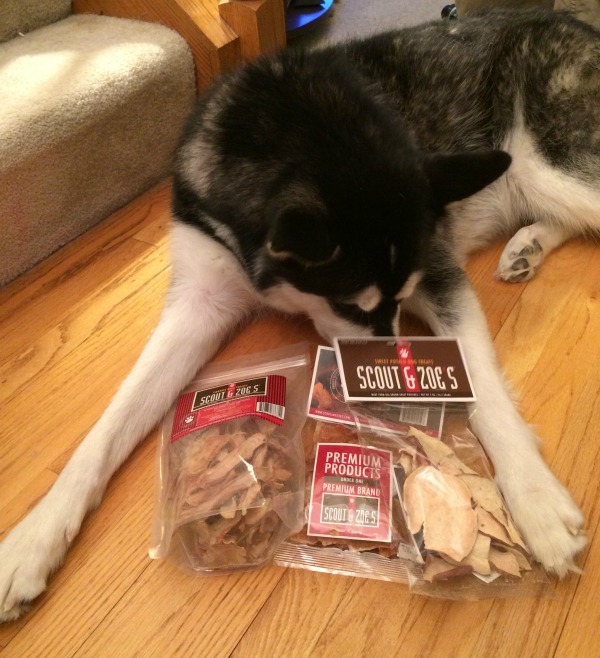 Scout Zoes natural snacks sound perfect for him. With so many dogs dying from treats made in China, my wife and I have become very picky about our dog’s treats. I like that these are made in the USA and are meat treats. Meat treats are our dog’s favorite treats and I can trust these to be safe. Thank you for the review.